My first set of Maude Mommy Note Pads are printing at this very moment and I am super excited!! They are the cutest!!! I heart Maude! I think I might start doing a monthly giveaway. Leave a comment on ANY POST throughout the month of August and on the last day of the month I will pick a winner from all the comments. 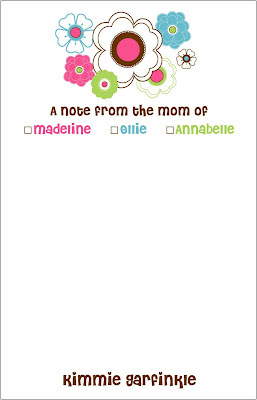 This month's prize is a set of "Maude" note cards because they are my most favorite at this very minute. You can read my generic response to the Bible verse question and other frequently asked questions on my FAQ page. Platter & Tray Sale This Weekend! Platters and trays are on sale this weekend! Place your order online or email me if the design you want isn't shown. I've listed the Halloween, Thanksgiving & Christmas designs. Seriously. I like rushing the season. Sale ends Sunday late night. LOVED this custom order for PINK MOUSE items!! I LOVED making this big cake topper! It turned out cute and I can't wait to make more of these! Platters & Trays make great wedding gifts!!! Coming Soon...Lunch Sacks for Boys! Bag Tags, Bag Tags, Bag Tags!! !